VST3 Plug-Ins Released: So What? We are glad to announce the release of a major update of 16 of our plug-ins, including – among other improvements – VST3 versions. So, what would you use these new VST3 versions for, and what is the benefit for our plug-ins, compared to existing VSTs? 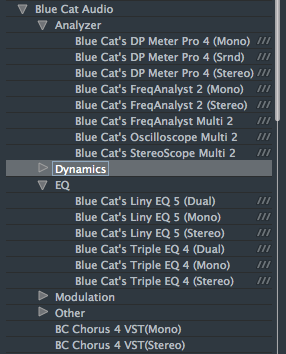 You will probably be happy to benefit from this improvement if you own one of our plug-ins with an external side chain input: Blue Cat’s PatchWork, Blue Cat’s Dynamics, Blue Cat’s MB-7 Mixer, Blue Cat’s Plug’n Script. 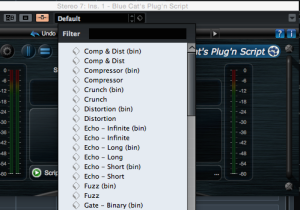 Oh, and by the way, if you still have plug-ins with sidechain that are not available in VST3 format, you can use Blue Cat’s PatchWork VST3 to host them in Cubase and Nuendo and get native side chain support right away! Silence Detection: Our plug-ins already have silence detection included for all formats, so that no processing happens when the plug-in is fed with silence. With VST3, some (but not all) hosts will directly provide this information to the plug-in, so it could bring minor performance improvements. Automation & Parameters Display: with VST3 parameter names are not limited to 8 characters anymore, and hosts will be able to display actual parameter values on automation lanes instead of percentages. The VST3 standard has however one major limitation regarding MIDI events: plug-ins can no longer process MIDI data directly. The main consequence with our plug-ins is that when used as VST3s, they cannot output MIDI CC events like with other plug-in formats. So if you intend to use the advanced MIDI output capabilities of our plug-ins, you should use the VST2 version instead. If you need both a native side chain input and MIDI routing on the same track, you can also use Blue Cat’s PatchWork VST3 to host the MIDI-aware plug-ins and connect them together inside PatchWork – audio and MIDI routing in PatchWork is much easier anyway. This ensures optimal compatibility with existing projects, and also lets you choose which particular features you want to use for every instance of a plug-in. So, Should I Switch To VST3? If you are currently satisfied with the VST version of the plug-in and you do not see any major reason above to switch, there is no probably need to add the VST3 version to your arsenal. However, if one of the improvements above matters to you and you can live with the MIDI limitations, it’s probably time to get the VST3 version! Anyway, the update is free for existing customers who are current with their licenses, and our free plug-ins are also available as VST3s, so why not give it a try? This entry was posted in FAQ, New Releases by bluecat. Bookmark the permalink. Not sure we understood everything properly (automatic translation is definitely not ideal), but thank you for your message!